This system includes Eight (8) of the patented NX Shark Nozzles, Two (2) NX Lightning series nitrous solenoids, Two (2) NX Lightning series fuel solenoids, anodized aluminum distribution blocks, 3/16'' stainless hard lines, nickel plated fittings, jetting for 200-600 HP, D-6 (-06AN) stainless braided nitrous feed lines, a high flow D-6 (-06AN) Y-fitting, a wide open throttle switch, 40-Amp relays and relay harnesses, master arming switch, stainless bottle brackets and a 15 lb. nitrous bottle with the NX Lightning 45 bottle valve. Superior Cylinder to Cylinder Distribution! Shark direct port systems ar ethe first choice for high horsepower direct port applications. The patented Shark nozzle features a proprietary design that mixes fuel and nitrous before exiting the nozzle body, this results in superb atomization at levels of up to 2000 horsepower on 8-cylinder applications. Standard distribution blocks are included but can be upgraded to high tech showerheads, or optional ''Next Generation'' rail technology. Shark direct port systems are available with standard Lightning solenoids, Super Shark solenoids or the .250'' orifice Lightning 250 solenoids. These systems include stainless lines, nickel plated fittings, B-nuts, sleeves, -06AN high flow feed line and every nut, bolt, and electrical connector needed for installation. Systems with bottles include stainless bottle brackets as well as the lightweight, high flow, industry exclusive billet aluminum Lightning 45 bottle valve (systems with Lightning 250 solenoids include a DF5 nitrous bottle valve and -08AN feed line). 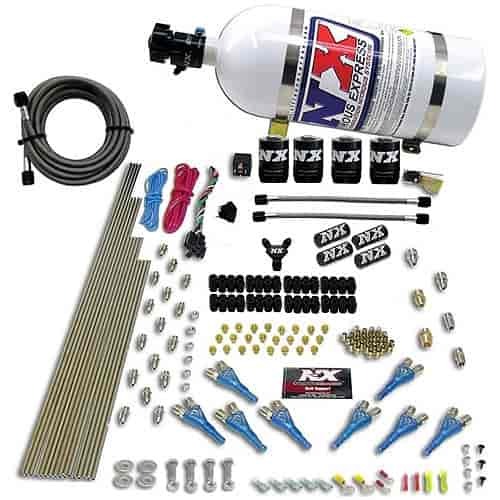 Nitrous Express innovates and leads the off-the-shelf nitrous system market! Their systems include the latest technology, designs and the best components available such as the NX Lightning nitrous & fuel solenoids. These solenoids feature an improved flow path that eliminates sharp turns and expansion areas in the nitrous flow path. This keeps the nitrous in dense liquid form which makes more power utilizing less nitrous. Lightning nitrous solenoids feature an integrated purge port which allows you to connect a purge valve directly to the body of the nitrous solenoid for clean looks and less plumbing. Lightning Series solenoids feature CNC aluminum bodies topped with Carbon Fiber cans for the ultimate in weight savings. This kit also includes a Nitrous Express bottle which features the legendary 'Lightning 45' bottle valve. This bottle valve features a large .325'' orifice with a direct flow path and ONLY one 45-degree turn to the outlet and a consistent inner diameter which provides outstanding laminar flow and eliminates any chance of those power robbing gaseous bubbles from developing. The 'Lightning 45' valve also features a built-in gauge port, a high flow push port and weighs less than old school brass bottle valves. *Click Here to see why NX Lightning 45 Bottle Valve, NX DF5 Bottle Valve and NX Lightning Solenoid outperforms the competition!